under the small umbrella: Don't look up! 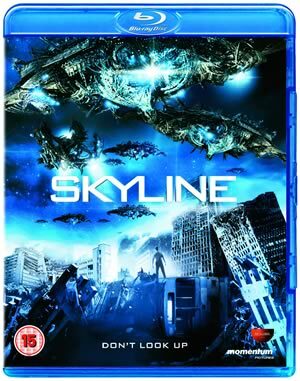 SKYLINE is a terrifying journey into our fear of the unknown, a high-velocity, special effects bonanza that resonates with feelings of urban panic in these dangerous times. Visual-effects masters The Brothers Strause (AVPR: Aliens vs. Predator—Requiem)—whose company Hydraulx has imagined visual effects for Avatar, 2012, Iron Man 2, The Curious Case of Benjamin Button and 300—have directed, produced and financed a spectacular and chilling independent film of epic proportions. For Jarrod (Eric Balfour) and Elaine (Scottie Thompson), a simple weekend away to visit friends Terry (Donald Faison) and Candice (Brittany Daniel) becomes a nightmare. As they watch in terror from Terry’s penthouse windows, people across the city are swallowed into massive alien ships that have blotted out the L.A. skyline: life as they know it is finished. With the military struggling to keep the aliens at bay, now it will take every survival instinct they have to elude capture from the thousands of monstrous creatures that are sweeping the city and searching for all humans in their path. From tankers to drones and hydra-like extraterrestrials, the aliens are inescapable and seemingly indestructible. Eric Balfour (24, Texas Chainsaw Massacre) stars alongside David Zayas (Dexter, The Expendables), Donald Faison (Scrubs), Brittany Daniel (Sweet Valley High), Neil Hopkins (Lost) and newcomers Scottie Thompson (Star Trek) and Crystal Reed (Crazy, Stupid, Love). SKYLINE is directed by brothers Colin Strause and Greg Strause, written by Liam O’Donnell and Joshua Cordes and producer Kristian Andreson.